Loving Mother, Daughter, Wife and Grandmother – Danielle Sheryl Hall of Delacour, Alberta passed away November 30, 2018. She will be forever missed by her loving family, husband Andy Hall; sons Colton (Katelyn) and Cody (Trinity); mother and father, Shirley and Bob Dunbar; grandmother Ella (Clifford) Felker; granddaughter Catalaya; father and mother-in-law, Allan and Carole Hall; sister-in-law, Jody (Dean) Barbuto, brother-in-law Tim Hall; nephew Wyatt McNiel; and special uncles, Berry Felker and Terry Felker; as well as numerous cousins and lifelong friends. Danielle had a zest for life that was contagious to everyone around her. Her love and passion for her family, and her love of horses and animals was unsurpassed. She will be deeply missed and forever loved. A Celebration of Danielle’s Life will be held at the Lions Club Event Centre, (109 – 5 Avenue, Cochrane, AB) on Saturday, December 8th at 1:00 pm. 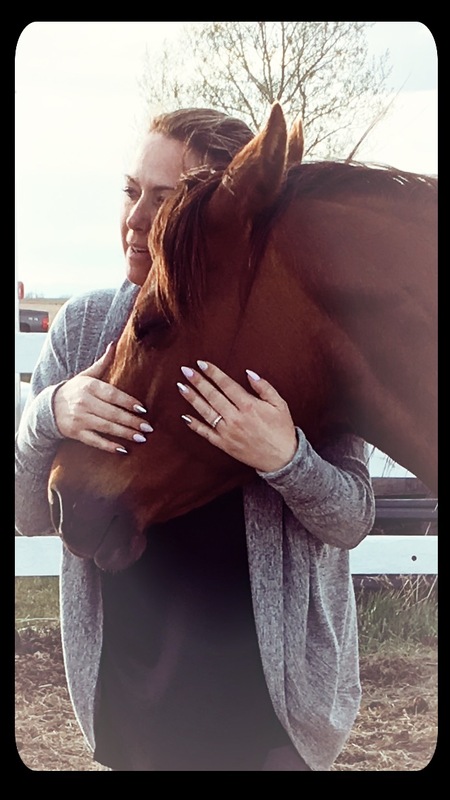 In lieu of flowers, a donation in Danielle’s memory may be made to either the Breast Cancer Society of Canada https://bcsc.ca/get-involved/donate/er or to an Animal Rescue service of your choice. I know it made you blue. I watched; I know this is true. Days after I passed away. I saw you kneel to pray. I was so saddened to hear of her passing. I was so excited to see her show her mare this fall and to see the enjoyment it brought her. Sending my sincere condolences to you all. Andy and Family so sorry for your great loss. Susan and I send our deepest condolences. Love give you comfort in the days ahead. So sorry for your loss. All the Best to you and your family. Deepest condolences Andy and family, all the best to you at this time. Dear Andy and Family; Were so sorry for you and your family. May you be surrounded by your family and friends who care, words that sooth, hugs that warm, memories that console and love that heals. Let the boys and that wee Grand Daughter,Mom and Dad,Sis and your Bro lean on one and other. Never be scared to ask for help they will all be there for you. Love and prayers to your family, Andy. So sorry for your families great loss. Dear Andy… It’s with great sadness and heavy hearts that we are sending you and your Family our sincere and deepest condolences for the loss of Danielle. So sorry for your loss. Thoughts and prayers with you all at this time. We are so sorry for your loss. Our thoughts are with you and your families at this time. My most sincere condolences to you all. I hope beautiful memories bring comfort to you during this sad time. Sending our condolences to you Andy and family. When grief is deepest, words are fewest (Ann Voskamp). Dear Andy and family, it is with great sadness and heavy hearts that we are sending our deepest condolences. There are no words to express how sorry we are for the loss of Danielle. Our sincere Condolences to your families. It’s heart breaking to hear of your loss. I’m going to miss her dynamite sense of humour & quirky banter on FB. My sincere Condolences to your family. I have many memories riding with Danielle. I am so so sorry for your loss. Danielle is a good friend, we laughed so hard all the time, she had a great sense of humour. I am out of words, I’m heartbroken, i will see you again my friend, my prayers are with your family. Dear Andy and Family, we are so sorry for your loss. Jennifer and I send our deepest condolences. May all your memories give you strength in the days ahead. So sorry for you and your family’s lost . We would like to express our sincere condolences to you and your family on the loss of Danielle. When someone you love becomes a memory, the memory becomes a treasure. Our thoughts and prayers are with you all. Jack and I send our deepest sympathies to all. There are no words….but there are precious memories, heartfelt wishes and healing thoughts. Thinking of you all during this difficult time. My deepest and most heartfelt condolences at this very difficult time. I’m keeping you all in my prayers and thoughts. Please give my love to Auntie Ella. We are so sorry for your loss. Our deepest condolences. So sorry for your loss, our thoughts are with you Andy, Colton, Cody and families. Sending you all hugs. Andy and Family, so very sorry for your loss. Our thoughts are with you at this difficult time. We were thankfully together as a family when we received the news. It has been a lifetime friendships between our families. We wish for peace of heart and lice out her passions and loves as she would have. May she truely rest in peace and let her wings fly. She will be missed! May her loved ones remember and reflect on so many great memories snd celebrate the life she lived! Sending heartfelt condolences to the family. I am sorry you had to go Danielle… Cohen says the good people are called home early so they can live pain free and be surrounded by love and peace. I wish these things for you. Cohen,We are keeping You and Your Family Lifted up in Our Prayers,We are so sorry for Your Loss. Dear Andy – our hearts break for you and your boys and your extended families. Lean on your treasure house of happy memories to help you through this time. Much love is sent your way. Dear Andy and Family we are so sorry to hear of your loss, are deepest condolences.